ePosters - Just how many unknowns are there in a metabolomics data set? Really? 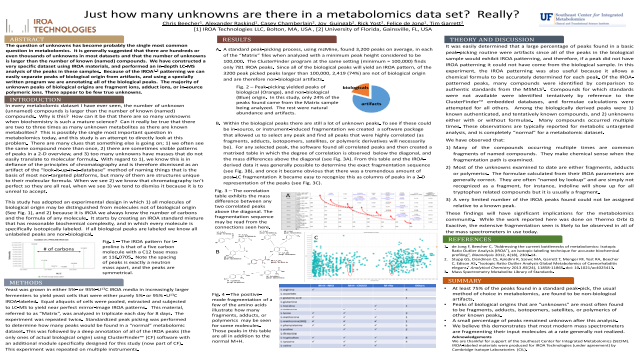 Poster Title: Just how many unknowns are there in a metabolomics data set? Really? Abstract: The question of unknowns has become probably the single most common question in metabolomics. It is generally suggested that there are hundreds or even thousands of unknowns in most datasets and that the number of unknowns is larger than the number of known (named) compounds. We have constructed a very specific dataset using IROA materials, and performed an in-depth LC-MS analysis of the peaks in these samples. Because of the IROA1,2 patterning we can easily separate peaks of biological origin from artifacts, and using a specially written program we are annotating all of the biological peaks. The majority of unknown peaks of biological origins are fragment ions, adduct ions, or in-source polymeric ions. There appear to be few true unknowns. Summary: Many of the compounds occurring multiple times are common fragments of named compounds making chemical sense when the fragmentation path is examined. Most unknowns examined are either fragments, adducts or polymerics. The formulae calculated from their IROA parameters are generally correct. They are often “named by lookup” and are simply not recognized as a fragment. A very limited number of the IROA peaks found could not be assigned relative to a known peak. References: de Jong F, Beecher C, “Addressing the current bottlenecks of metabolomics: Isotopic Ratio Outlier Analysis (IROA®), an isotopic-labeling technique for accurate biochemical profiling”, Bioanalysis 2012, 4(18), 2303-14. Stupp GS, Clendinen CS, Ajredini R, Szewc MA, Garrett T, Menger RF, Yost RA, Beecher C, Edison AS. “Isotopic Ratio Outlier Analysis Global Metabolomics of Caenorhabditis elegans.” Analytical Chemistry 2013 85(24), 11858-11865. doi: 10.1021/ac4025413.